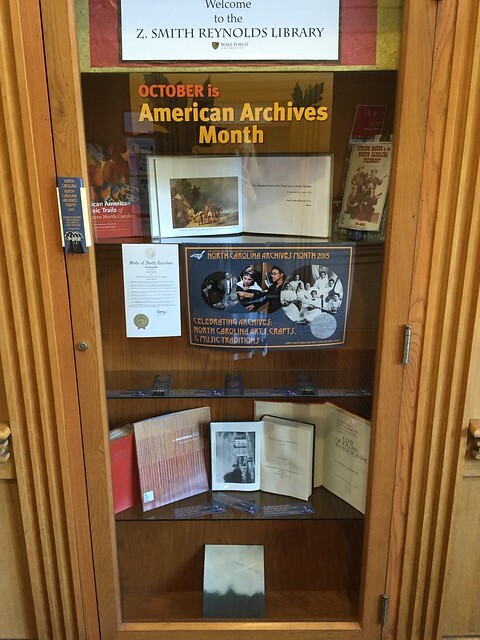 October is American Archives Month! Each year, archives across the nation celebrate Archives Month by advocating for archives, planning events related to archives, and generally singing the praises of archives near and far. 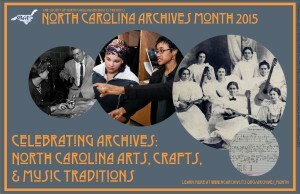 The Society of North Carolina Archivists (SNCA) assigns a theme for North Carolina’s Archives Month. This year’s North Carolina Archives Month theme, “Celebrating Archives: North Carolina Arts, Crafts, and Music Traditions” encourages, but does not limit, archival repositories to focus their programming on arts, crafts, and music themed holdings. Each year, SNCA’s Archives Month Committee (this year chaired by our very own Director Tanya Zanish-Belcher) designs a poster and bookmark to distribute to institutions across the state to publicize the celebratory month. 2015 Archives Month bookmark featuring a WFU Archives image. Here at ZSR, Special Collections & Archives has put up a small exhibit in the front entrance of the library. Special Collections & Archives is also planning an event at the end of the month to celebrate Archives Month . “Art in the Archives: A Celebration of Campus Galleries” will pair the University Archives with the Hanes Gallery and the Start Gallery to start archival collections for their records. More details will soon be released about the “Art in the Archives” event, but go ahead and mark your calendars for Thursday, October 29th, 2015 from 4-5:30.